Best known for their 1971 hit version of "This Wheel's On Fire", Sydney band Flake is remembered by those who saw them as one of the most accomplished and versatile ensembles of the period, capable of performing the latest pop hits or the music of Jefferson Airplane with equal assurance. 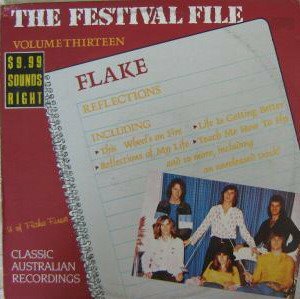 Flake came to prominence at a time of change, both in Australia and internationally, as "pop" was diversifying into distinct new genres like heavy rock and progressive rock. As a result, their repertoire covered an extraordinarily wide of contemporary styles, from melodic pop, through blues, soul and R&B to psychedelia, 'prog' and heavy rock. The group began in late 1968 when drummer Wayne Thomas quit Sydney band Plastic Tears to form his own group. He recruited four other players he knew -- singer Geoff Gray and bassist Laurie Sinclair (ex The Eli) and organist Rob Toth and guitarist Lindsay Askew (ex The Seen). The new band rehearsed solidly for three months but Laurie Sinclair was forced to drop out before their first gig due to the fact that his father died, his house burned down, he split up with his girlfriend and he had been called up for the Army -- all in the space of one week! Thomas called in Plastic Tears bassist Mick Gaul to replace Sinclair, and the new lineup was completed when Wayne's friend Steve Williams introduced the band to singer Sharon Sims. She had done some guest spots with Steve's band The Good Intents and he was hoping to further her career by getting her a spot in the new group. Needless to say, Sharon's scorching soul voice blew them away and she joined in time for their first official gig at Shrublands Hall in Marrickville on 14 November 1968. The band's name had been decided only three weeks earlier, and it was taken from the classic 1968 Small Faces LP Ogden's Nut Gone Flake. It was not, as is sometimes claimed, inspired by the well-known brand of chocolate bar of the same name (which in fact did not hit the Australian market until about a year later). There were several changes of personnel during 1969. Mick Gaul left the band and was replaced by Denis Moore (recently returned from the USA) who was known to Thomas from his time with Sydney band Him & The Others. Not long after, Lindsay Askew and Rob Toth both left due to the difficulties of balancing work and band committments -- all the members somehow managed to hold down day-jobs -- and Toth subsequently joined Samael Lilith. Askew and Toth were replaced by Dave Allen (flute, sax) and Ross Jeffries (guitar), both from Fred Karniss Army, but Jeffries was not 'in synch' with Flake's style and bowed out after a few rehearsals. Through Denis Moore, the band recruited guitarist John Russell (ex Amber). Next to leave was Sharon Sims, who had been lured away to another band, so Thomas 'pinched' another member from Fred Karniss, singer Denise Caines. Not long after Denise joined Sharon Sims returned after her other venture went 'belly-up'. After some negotiation it was decided to expand the group to seven-piece. Fortunately Denise and Sharon got on well, and their distinctive but complementary vocal styles enabled Flake to tackle an even broader range of material. Now boasting a unique three-voice frontline, Flake was capable of tackling a remarkable breadth of material --Sharon's soulful voice was ideal for classics like "River Deep, Mountain High" and "Respect", while Denise excelled on songs like Jefferson Airplane's "Somebody To Love" and "White Rabbit" and Flake was of the only Sydney band at the time that could pump out note-perfect renditions of this and other challenging like Traffic, Spooky Tooth, Jethro Tull, The Moody Blues, Rotary Connection, Vanilla Fudge and Deep Purple. Flake now started looking for a record deal. They had preliminary discussions with EMI, who lined up the renowned David Mackay as producer, but EMI's offer was for two Singles, with the recording of an album dependent on both Singles being hits. At this point independent producer Martin Erdman made them a better offer -- he would sing them to his Du Monde label for two Singles, plus an album, providing Flake had reasonable success with at least one of the Singles. In early 1970 Flake went to Erdman's World of Sound studio at Ramsgate. The tracks they recorded were the Jackie Lomax song, "You've Got Me Thinking" as the A-side, with as the flip. Unfortunately, although Sydney radio programmers liked the band, they didn't like the song, so Wayne Thomas (who had chosen the A-side) then approached 2UW programmer Gary Jaegear for help. 2UW had rejected the A-side -- but not the B-side, Dylan's "This Wheel's On Fire" -- so Jaegar generously slipped "This Wheel's On Fire" onto the 2UW playlist. Fortunately for Flake, the single came out at the start of the Radio Ban, which began in May 1970. While this controversial six-month dispute between commercial radio and record companies raged, many major label recordings -- particularly UK hits released or distributed by EMI-- were banned from commercial radio, giving independent labels like Du Monde, Fable, Sparmac and Image unprecedented access to commercial radio playlists. Before long it was picked up by 2SM and then by stations in other cities. It definitely became a major national hit, although sources differ about exact chart placings. According to Wayne Thomas' History of Flake, it made the Top 5 nationally and stayed on the Go-Set chart for 18 weeks and charts reproduced in the CD-ROM of Martin Erdman's Du Monde compilation confirm his report that it went to #1 in the Sydney Daily Mirror chart and #2 in the 2SM chart, and that it made the Top 30 on 5AD Adelaide. Ian McFarlane's Encyclopedia entry on Flake says that it went Top 5 in Sydney (#4, July) and reached #20 nationally, whereas Martin Erdman asserts that it "reached ... No 7 nationally". Vernon Joyson claims that it spent 25 weeks on the chart. Martin Erdman also reports that the single was originally released by Festival with an orange label, but this was interrupted by the Radio Ban, so Erdman's own World Of Sound company took over pressing and distribution, with Singles released with both gold and orange labels. The single also won the 1970 2SM Australian Talent Award. In the wake of the single's success Flake toured extensively up and down the east coast, all the while balancing their music career with their day jobs. Inevitably the strain began to tell and the first to leave was Dave Allen. His replacement was Billy Taylor (ex Purple Vision), who took over on rhythm guitar aas well as adding an extra voice to the band's already powerful vocal lineup. Taylor soon became close friends with singer Geoff Gray and the band's roadie Paul Berry, and they soon moved into a flat together. During this period Flake recorded a performance of a song from their repertiore, "Midnight Train", for the ABC's GTK pop show, but it is not yet known whether this still survives in the archives. The band went back into the studio to record their second single, a cover of "Reflections of My Life". The original recording by UK band Marmalade had been another victim of the Radio Ban. It featured a fine guitar solo by Taylor, with John Russell playing autoharp in background, and the overdubbed orchestral arrangment was performed by the Rocky Thomas Orchestra. Denise Caines left the group in late 1970, so Billy Taylor recruited former Purple Vision singer Shauna Jensen, who added her own superb voice to the mix and became fast friends with Sims. Caines' departure was followed by that of Denis Moore, and to replace him Billy Taylor brought in another old friend, bassist Greg Higgs, also an excellent singer with a strong vocal resemblance to Paul McCartney. As Wayne Thomas recalls, this version of Flake (Sims, Gray, Russell, Taylor, Higgs and Thomas) was the band's most commercially successful phase and the lineup that most people remember, and it was during this period that the gorup played its first concerts in Melbourne. Shauna Jensen only perrfomed with Flake for about three months with Flake, but she did appear on the B-side of "Reflections of My Life", singing the lead vocal on Flake's cover of the Rotary Connection classic "Teach Me How To Fly" (also sucessfully recorded by Jeff St John) which had been part of Flake's live set for more than two years. The new single performed well and gained strong airplay;, charting in the Top 30 nationally and peaking at #11 in Sydney in January 1971. Although there was now a strong demand for an album, Erdman decided to release another single first, to launch his new Violet's Holiday label. Flake were given four songs by the renowned songwriting team of Vanda & Young, and they chose one of these, "Life Is Getting Better", as their next single, which again featured an orcdestral arrangment by Rocky Thomas' orchestra. It did very well in Sydney, where it reached #12 in mid-1971. The band's fourth single "Under The Silent Tree" (sourced from a little-known UK band called Honeybus and written by Ray Kane/Cane) featured scorching soul harmonies by Sharon, Geoff and Greg and a powerhouse solo by Taylor, and although it was musically the group's strongest single yet, many pop stations considered it a little too "heavy" and it didn't get much airplay, although it did manage to get to #26 on Adelaide's 5AD. Flake's only LP How's Your Mother? was finally released on Erdman's Violet's Holiday label in December 1971, although the double pressures of touring and maintaining day jobs gave the band little time to record, so there was not much new material and the album was filled out by tracks from the earlier Singles. Aided by their friends, singer and lyricist Gary Paige and guitarist Hubert Williams. The LP's lavish gatefold sleeve was Sporting a 'trippy' cover design, the album featured lighter pop-soul material on Side 1, with Side 2 featuring the band's heavier and more psychedelic side, highlighted by the epic 12-minute track "Violet Jam" (the second part of which was the Vanda-Young track "Quick Reaction"). Like many independent LP releases that came out during this transitional period (e.g. Galadriel, Melissa, McPhee) the Flake LP had no commercial success at all and it has become a rare collector's item. Just before the album came out Billy Taylor left the group and he was replaced by Mick Meehan (ex Cinnamon). The album track "Under The Silent Tree" was released as the group's fourth single and it did moderately well, reaching #35 in Sydney in November 1971. Flake continued to be a popular attraction through 1972 but they released only one more single, "Where Are You" (Dec. 1972), which did not chart. The A-side was co-written by members of the band with lyricist Gary Paige (who also sang on the recording); the string arrangment by Rocky Thomas was overdubbed at Festival Studios. Paige, a prolific and very successful songwriter, has collaborated with many notable Australian and international composers, and he is probably best known for the pop-soul classic "Heading In The Right Direction" (co-written with Russell Dunlop) which was famously recorded by Renee Geyer. Sharon Sims recorded her first and only solo single "To Be The One You Love", which came out in February 1973. Recorded at ATA Studios in Sydney, it was co-produced by Martin Erdman and Richard Batchens and engineered by the great Bruce Brown with the orchestral arrangement (again by Rocky Thomas) featuring Terry Wilkinson on grand piano. According to erdman, the song was an English version of the theme from an Italian movie called Venetian Anonymous. By the end of the 1972 Flake had split up, with Wayne Thomas going on to to form a new band, Mr Madness, which was effectively a reunion of most of the original Flake -- Lindsay Askew, Mick Gaul and Rob Toth -- plus Roy Ritchie on guitar. In early 1973 a new Flake lineup was formed by Billy Taylor and John Russell, with Ted Atkinson (bass) and Jim Penson (drums, ex Blackfeather, but by mid-year the lineup had changed to include two other former Blackfeather members, bassist Warren Ward (ex Flying Circus) and singer Neale Johns. This new Flake recorded one hard-rock single, "Scotch On The Rocks", which was released on Festival's Infinity imprint in February 1974. This last version of the group broke up at the end of '74, with Taylor subsequently joining Neale Johns in a new formation of Blackfeather in 1975. In 1989 Glenn A. Baker compiled an LP anthology of Flake's recordings for the Festival File series, and renewed interest in the band led to a 'reformation' of sorts featuring Lindsay Askew and Wayne Thomas from the original lineup, plus, Rob Askew (bass), Gordon Sheard (guitar) and Anna Medley (vocals). This version of the group played around Sydney for about a year before splitting up in 1991. 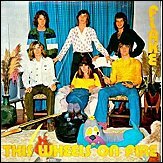 "This Wheel's On Fire" was included on the CD version of Glenn A. Baker's So You Want To Be A Rock'n'Roll Star? collection and more recently, several of Flake's Singles tracks were included on Martin Erdman's comprehensive 4-CD anthology The Du Monde Years. 8. "Dream If You Can"
Please email webmaster@milesago.com if you have extra information or corrections, or to a report any broken links.